Herbaceous, pine cones, ginger, ginger root, strong pungent raw honey, celery stalk. Sour dough, pickled turnip, ginger root again, faint root beer, just too much ginger again. Not impressed. Spearmint gum fans would like this. A little stale smoke, but just nothing great here. Adding a few drops of water did not help. Nominal peat and smoke and very very little sherry. The bourbon casks dominate with ginger notes. Just not liking this. People who like Glenkinchie 12 might like this, but I am not a fan of that malt either. Doesn't sound like my cup of tea either. That's the great thing about single malts and other quality spirits, smell and taste are very personal. 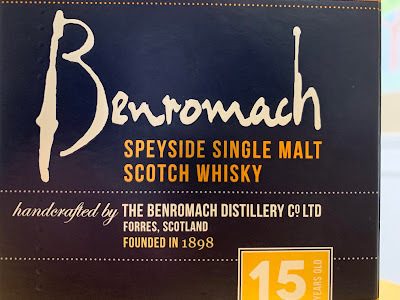 Just cracked a bottle of the Benromach 15 earlier this week and found it astounding. For my palate, it has so much complexity, taking me on a journey though sour, bitter, sweet, and umami. Every smell and taste, I get something new to discover. So while I disagree with you on this one, I always enjoy your honest and no-frills reviews. Cheers!